Collaborate on Use of Mobile in Preparation for and Response to Natural Disaster. Guatemala City: Claro, Movistar and Tigo have signed a cooperation agreement with the GSMA and the International Federation of Red Cross and Red Crescent Societies (IFRC), pledging to work together on the use of mobile services to prepare for and respond to emergencies caused by natural disaster through the We Care Guatemala campaign. Guatemala is one of the few countries where three tectonic plates converge. It is also home to 288 volcanoes and structures of volcanic origin, eight of which register activity. The country is also highly prone to the impact of weather phenomena such as El Niño and La Niña, which can have humanitarian consequences across the country. 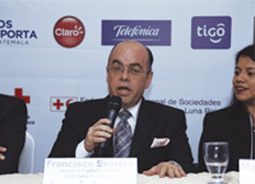 “Collaboration between the national mobile industry and the Guatemalan Red Cross is essential to optimise the benefits that mobile technology can play in responding to natural disasters,” said Sebastián Cabello, Head of GSMA Latin America. Analysing the best technologies to implement for emergency response. As part of this joint campaign, Claro, Movistar and Tigo are adhering to the GSMA Humanitarian Connectivity Charter, whose principles commit them to enhance coordination within and among mobile network operators before, during and after a disaster, and strengthen partnerships between the mobile industry, government and the humanitarian sector. The IFRC and the GSMA view this agreement as confirmation of the desire of both organisations to continue working with national societies, mobile operators and governments to provide humanitarian aid to people who need it, when and where they need it. “It’s important to create partnerships like this, because the people of Guatemala benefit most. 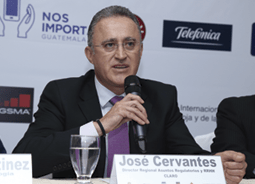 Otherwise it would be complicated to implement programmes that are so necessary for Guatemalans and their families,” said Francisco Evertsz, Regulatory and Institutional Relations Manager, Telefónica Móviles Guatemala. “For Claro, as a subsidiary of América Móvil, managing sustainability effectively and comprehensively is part of our commitment. That’s why we support this partnership to place our mobile technology platform at the service of the people of Guatemala and contribute to better disaster management response in emergency situations,” said José Cervantes Rivera, Director of Human Resources and Regulatory Affairs for Central America in Claro. The GSMA We Care campaign is an initiative of the leading mobile operators in Latin America to ensure all their users can enjoy the life-changing benefits of mobile technology in a safe and secure environment. To achieve this, operators have decided to join forces as an industry and take on a series of commitments in every country in the region where mobile phones and networks can provide solutions to social problems. We Care has already been launched with several initiatives in Argentina, Bolivia, Brazil, Colombia, Costa Rica, El Salvador, Honduras, Mexico, Nicaragua and the Dominican Republic, and will continue to expand throughout the region. The Humanitarian Connectivity Charter was launched at Mobile World Congress 2015 and currently includes 105 signatory operators in 77 countries.